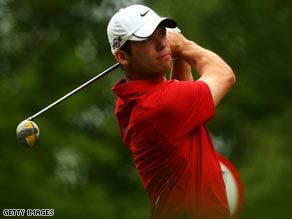 (CNN) -- Englishman Paul Casey is now third in the world, behind only Tiger Woods and Phil Mickelson, after three birdies in his last four holes, including at 17 and 18, gave him a thrilling one-stroke victory in the BMW PGA Championship at Wentworth on Sunday. Casey has moved up to third place in the world after three late birdies saw him win the BMW PGA Championship. The 31-year-old Ryder Cup player, who led from the halfway point, recorded a 72-hole total of 271 (-17) to hold off the challenge of fellow-Englishman Ross Fisher -- whose best-of-the-week 64 was only one outside the West Course record. However, the outcome was far from certain when Casey, 41st in the world at the start of 2009 and seventh entering the tournament, found a greenside bunker with his approach to the par five final hole. But he splashed out to just five feet and made no mistake with his putt to claim the massive $1m first prize at the European Tour's flagship event. "It was not an easy putt, but any putt to win is something I would like to have," Casey told Press Association Sport. "There are great names on this trophy and it feels great. A lot of people have put in a lot of work, but I have to thank Peter Kostis, my coach in the States. He is more than a coach and we set some lofty goals at the start of the year." It was Casey's third win of the year following his victory at the Abu Dhabi Championship in January and maiden win on the US tour at the Houston Open in April -- and he becomes only the fifth Briton to have made it into the world's top three since the rankings were introduced in 1986, following in the footsteps of Colin Montgomerie, Nick Faldo, Sandy Lyle and Ian Woosnam. Of that quartet, only Montgomerie has not won a major and that will be the next objective for Casey as he prepares for the upcoming US Open and July's British Open at Turnberry. Meanwhile, Denmark's Soren Kjeldsen finished in third place, four shots behind Casey after a closing 69. Fisher's final round will have exorcised his demons from 2007, when he led this tournament with a round to play only to slump to 39th spot with a final round 84. He was 20 shots better on Sunday and could have equalled the West Course record if he had been able to hole an 18-foot eagle putt on the last green. Even Fisher could not match the finish of 2003 British Open winner Ben Curtis, who birdied the 15th and 16th and then eagled the two closing par fives for a 67 and joint sixth place. Defending champion Miguel Angel Jimenez was never in contention but had the consolation of an albatross after he holed his 206-yard six-iron second to the long fourth.